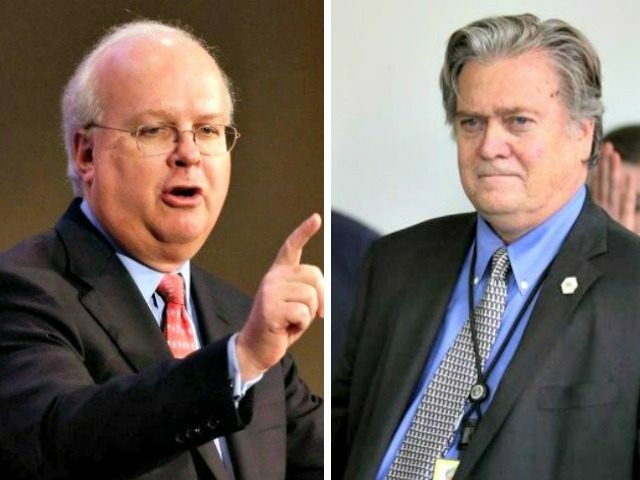 Establishment Republican strategist Karl Rove took a swipe at Breitbart News Executive Chairman and former White House Chief Strategist Steve Bannon Wednesday, with a snobbish article in which Rove turns up his nose at the “motley crew” Bannon is assembling for the 2018 midterms. In the article in the Wall Street Journal, “Steve Bannon’s Motley Crew of Challengers,” Rove does a drive-by smear of a number of candidates Bannon has approved to run against establishment-backed Republicans in 2018. Calling Bannon a “failed presidential adviser” in his opening paragraph, he omits Bannon’s central role as Trump campaign manager in guiding the candidate to victory last year. Although Rove notes the Bannon has set his sights primarily on the Senate and challenging Senate Majority Leader Mitch McConnell’s leadership, Rove first turns to House candidate and former Rep. Michael Grimm, whom he notes resigned his seat in 2015 after pleading guilty to tax fraud. Yet among conservative circles, concerns about such things are hardly rare. In fact, the most influential book of 2015 was Ann Coulter’s Adios America: The Left’s Plan to Turn our Country into a Third World Hellhole, which is believed to have influenced President Trump into putting immigration at the center of his presidential campaign. Rove continues to fire quick hits at passing candidates, referencing Kelli Ward’s (challenging unpopular Arizona Sen. Jeff Flake) support for the elimination of the Patriot Act, and for having “praised” Edward Snowden — although he does not quote her remarks. He also counters Bannon’s claim that he is trying to get people into office who support Trump’s agenda by arguing that six of the seven Republican senators Bannon is challenging “have voted with the president’s position more than 90 percent of the time.” Yet crucially, Rove does not indicate what the 10 percent of disagreement is over. He argues that the December Senate race in Alabama, after Judge Roy Moore beat the establishment-backed Luther Strange, will be the first test. “While still favored to win, Mr. Moore’s margin will be the first evidence of whether Mr. Bannon has picked a team of winners or just a collection of misfits and ne’er-do-wells,” he says sulkily. Breitbart News’s Raheem Kassam this week noted the link between Rove and a Fox News poll showing Moore and Democratic opponent Doug Jones essentially tied.